In covered food processor, process flour, 1 tablespoon sugar and the salt with on-and-off pulse to mix. Add cold butter; pulse several times. Slowly add ice water, pulsing until dough holds together. Do not over mix. Place dough on lightly floured surface; gather dough into a ball. Wrap dough in plastic wrap; refrigerate at least 30 minutes. To make Filling, in medium bowl, gently toss strawberries, mango and 1 tablespoon sugar. Refrigerate. To assemble tartlets, heat oven to 350°F. Spray 12 to 15 (3-inch) tart pans with cooking spray. On floured surface, roll out dough with rolling pin. Cut dough into rounds slightly larger than pans. Press dough rounds in bottom and up side of each tart pan; trim any dough overhang. Place pans on cookie sheet. Bake on center oven rack 15 to 20 minutes or until shells are light golden brown. Place cookie sheet on cooling rack; cool shells in pans. Remove Tartlet Shells from pans. Spoon and spread dollop of dulce de leche in each shell. Add spoonful of strawberry-mango mixture to each. Garnish each with mint leaf. Dulce de leche is readily available in the baking or Latin foods aisle in the supermarket. 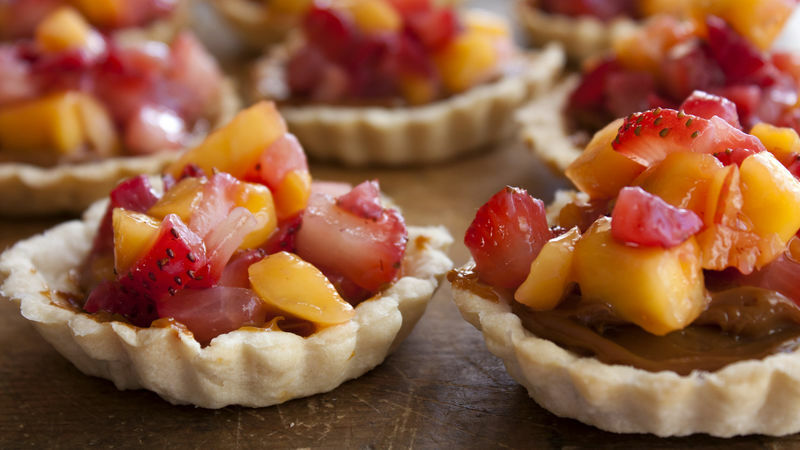 Enjoy the tartlets cold or at room temperature. You can substitute miniature muffin pans for tartlet pans.